NAIA Shuttle Bus got a new look and a new name. It is now called Airport Loop. 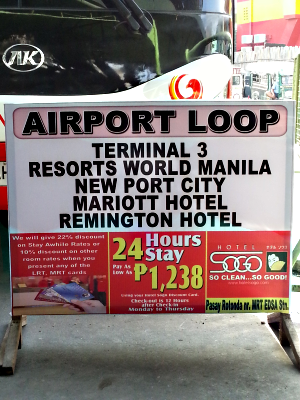 And to make it easy for commuters to identify the bus headed to NAIA-3 among many others inside Pasay Rotunda bus terminal, all airport loop buses have big signage on their both sides that reads Airport Loop. There is also big banner sign located where an Airport Loop bus parks to load passengers. Airport Loop bus enters Pasay Rotunda Terminal. There are two kinds of buses that served as Airport Loop. There's the one with all white outer body color with black signage that reads 'Airport Loop' on its both sides (photo below.) This one is the offshoot of the all white NAIA shuttle buses that preceded airport loops. The second one is the bus owned by HM Transport, Inc. 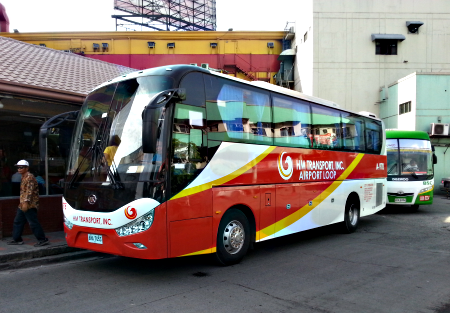 Body color is orange and on its both sides printed is 'HM Transport Inc Airport Loop' (photo above.) These buses are bigger ones compare to the white ones. They are new fleet of buses. But there are few which are old and a bit rundown but I think those old ones are being phased out. Airport Loop bus stops at first bus stop inside Newport City. Unlike before when you can easily see NAIA Shuttle Buses upon entering the big Pasay Rotunda Bus Terminal, the new slot of Airport Loop bus is located far inside of the massive provincial bus station. If you don't know the location of Pasay Rotunda bus terminal, please see map in our post NAIA 1-2-3 Shuttle Bus: Easy Way To Get To & From NAIA Terminals. Upon entering the bus terminal via access where McDonald's is located, walk along the left side of the terminal all the way straight past all the row of establishments there. Soon you will see this sign. If there's no Airport Loop bus behind the signage, just wait until it arrives. In four maps below are spots where you can get off the bus. Click each red bus stop icon in the maps for accurate information. Bus Stop icon 1 - Airport Loop terminal in Pasay Rotunda. Remaining passengers that take the bus from Terminal 3 alight here. All passengers headed to NAIA terminals 4,2 and 1 from here must alight at Terminal 3 to transfer to another Airport Loop bus. Details direction on how to get to this bus terminal in the post NAIA 1-2-3 Shuttle Bus: Easy Way To Get To & From NAIA Terminals. Bus Stop icon 2 - If your destination is northern tip of Newport City like Emperador Bldg, you can ask driver to drop you off here. But it is not designated bus stop so if driver won't allow it, get off the bus at the first bus stop inside Newport City and take Newport City free shuttle. Read detailed direction in How to get to Newport City Destinations via Airport Loop. Bus Stop icon 3 - Airport Loop Unloading Area in NAIA-3. Unloading in T-3 is far from loading area so if you are headed to any of terminals 4,2 and 1 and you have heavy luggage ask driver to drop you off at the loading bay of Airport Loop. The bus will pass through it anyway. He will allow it based on what I have observed. Bus Stop icon 4 - First Bus Stop inside Newport City. You can get off here if your destination is any of the following: Shrine of St Therese (church), Belmont Hotel, Emperador Bldg (take free shuttle), Star Cruise, Marriott Hotel, etc. Read How to get to Newport City Destinations via Airport Loop. Bus Stop icon 5 - Second Bus Stop in Newport City. Alight here if your destination is any of the following: Remington Hotel, Resorts World Manila, Newport Mall, Newport Performing Arts Theater, etc. Again, go to link given in 'Bus Stop icon 4' for details. Bus Stop icon 6 - Airport Loop Terminal in NAIA-3. This is the terminal of all Airport Loop buses headed to all other NAIA terminals as well as Pasay Rotunda Airport Loop terminal where MRT/LRT stations are located. If you are an arriving passenger from Terminal 3 proceed here from Arrival and look for banner sign that reads 'Baclaran Pasay Rotunda MRT/LRT.' 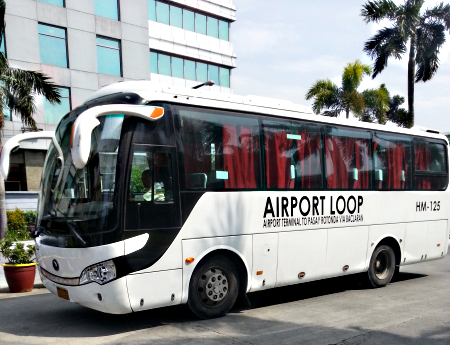 If you are arriving passengers from Terminal 1 or 2 or 4 and you want to take Airport Loop to train station, take an Airport Loop shuttle headed to NAIA-3 at loading area in your Terminal of Arrival. For details read NAIA 1-2-3 Shuttle Bus: Easy Way To Get To & From NAIA Terminals and NAIA 1-2-3-4 Shuttle Bus Updates. Bus Stop icon 7 - First stop from NAIA-3 Loading bay. located along Airport Rd past the corner of Quirino Ave. Bus Stop icon 8 - Second stop Baclaran Redemptorist. The bus stops along Roxas Blvd near Redemptorist Church. Because of bad traffic situation there's no fixed bus stop here so it could be way far from Redemptorist. After the bus stops here, it will now proceed to its terminal in Pasay Rotunda without anymore stops. All remaining passengers will be dropped inside Pasay Rotunda Bus Terminal. First map - Zoom out level for bird's eye view of the entire Airport Loop route. Second map - Airport loop turns left from Aurora Blvd headed to NAIA-3. Click the bus stop icon. Third map - Airport loop stops at T-3 then go to Newport City and returns to T-3. Click all bus stop icons. Fourth map - From T-3 the bus unloads passengers at 2 Baclaran bus stops before returning to MRT/LRT stations to drop remaining passengers and pick up passengers headed to NAIA-3 and Newport City in another new loop cycle. It enters bus terminal adjacent to MRT Taft Station. Hi, just want to ask. If I arrive at Pasay from NAIA what bus terminal in Pasay can I take going to Baguio City? Thanks so much Mark Ybanez for helping Alia. Plenty of bus terminals there. You can start at Genesis Terminal itself. 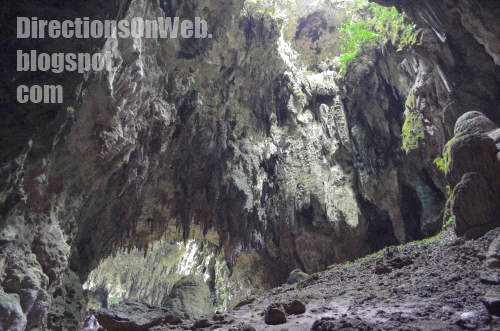 See if they have bus routes to Baguio City. All buses on the Airport Loop are operated by HM Transport /Worthy Transport. Those buses that have the same look as the one on the second picture used to be Fairview-Ayala bur but now repainted and reconditioned. You need to take another public transport form NAIA Loop Terminal in Pasay Rotunda. You need to read our previous posts about NAIA Shuttle/Loop. Hello. I will be flying out of NAIA T2 soon. I want to take the airport shuttle from Genesis Bus terminal in Pasay. I've taken it twice before to NAIA T3. Now I'm wondering, can I still take the shuttle to NAIA T3 then transfer to NAIA T2 via another airport shuttle? I cannot recall if T3 airport security checked my tickets before entering the airport the past times I used the airport shuttle. We entered through an entrance at the back of the airport. Will a ticket holder of a flight not departing from T3 be able to get in T3 then just take an the airport shuttle to the correct NAIA terminal? I'd appreciate any help on this. Yes. Actually, that's how it works. You get off at Terminal 3 and board another shuttle headed to both Terminal 1 and 2. Get off at your terminal destination. Great information! For everyone who need to know about price of Manila airport private transfer, please contact with GoAsiaDayTrip - the most trusted airport transfer and day tour company in Southeast Asia. May time schedule po ba yung mga bus papuntang airport?